For the past couple of weeks what talk had occupied neighbors about their stretch of road along Point Pleasant Drive in Palm Coast was the unusual, sudden construction activity: two lots within a few blocks of each other were just razed of trees and replaced with the buzz of contractors preparing new house foundations, the first such activity in the neighborhood in six years. Over the weekend, neighborhood talk focused on one of those two lots for a different reason. A makeshift cross had gone up in the swale by the side of the lot near 107 Point Pleasant Drive. 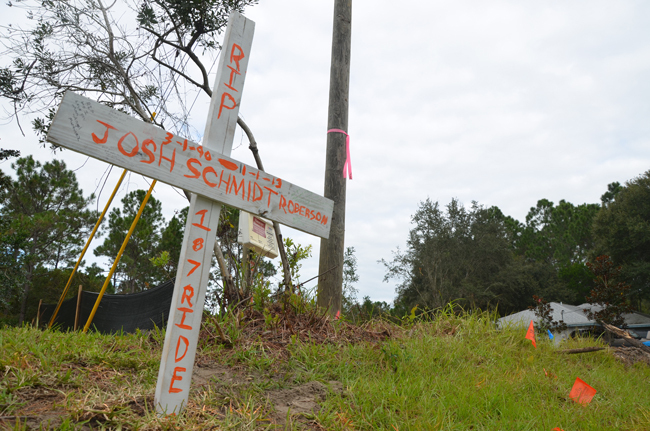 The cross bore a name in orange paint: Josh Schmidt Roberson. Joshua Schmidt Roberson, who was 23, killed himself at dawn Friday, during a brief standoff with police, after calling 911 five times and on several of those occasions just hanging up. After the first few calls a deputy was dispatched to a location on Postwood Drive, off of Point Pleasant, where the cell number that was calling 911 was “geolocated,” according to a police report. By then Schmidt had made contact with a dispatcher, but all the dispatcher could relay to the deputy heading to the location was that a man had called, the man was crying, and he could not verify his location. Schmidt is a resident of 64 Perthshire Lane, almost four miles away. The deputy was dispatched at 5:28 a.m. He located Schmidt at the construction lot on Point Pleasant, by which time several other deputies had also arrived. Schmidt had identified himself to deputy Christopher Santoianni. Schmidt held a gun in his right hand. Schmidt was sitting down. He was crying. He said he wanted to die. It was dark, but one deputy shined his spotlight on him, and told another deputy to do so as well, bright enough that one deputy noted the color of Schmidt’s yellow t-shirt. Meanwhile other deputies blocked off road access to the area. And the crisis negotiations team was called in, as were Flagler County Fire Rescue ambulance units and the Palm Coast Fire Department. Cpl. Eric Allen was also at the scene, as were other deputies. Some neighbors had noticed the commotion but were ordered back into their home. It’s not clear exactly how long the standoff lasted, but it wasn’t long: another deputy described the shooting taking place after “a short period of dialogue.” The crisis negotiating team had not arrived. Schmidt fell back, and the gun fell to the left of him. Deputies moved in and removed the firearm, a semi-automatic Kahr Arms. A paramedic pronounced Joshua Schmidt dead at 6:06 a.m. The area was cordoned off with crime tape. Several school buses that usually drive by that way, with a bus stop only a few steps from the lot, were diverted that morning. There were no work crews all day Monday at the lot under construction. A look at Schmidt’s Facebook page suggests he favored speedy cars, monster trucks, mud bogging and fishing. So young,., so sad. Hope he found deserving peace and comfort that and the Almighty embraces him. I am so sorry to read this. My condolences to the family, friends and loved ones of this young man. Josh was a great friend an he will be missed so much we love you josh ! So very sad…RIP Joshua….and I wish his family peace and healing. He was so very young to feel that hopeless. It is especially sad that he probably could have been helped with some treatment and gone on to live a happy life. This is just so tragic…..
Josh was in my life for a short time… He hung around my children and for Christmas gave me an ornament that his mother made . I remember him in the snow with his “toys”ripping around … My heart is sad. Tragic! With such bizarre circumstances, it would be interesting to know what a Toxicology Screen shows. This kind of self-destructive and apparently paranoid behavior needs an explanation. If there were drugs involved, I hope the authorities charge the dealers with Murder! I pray his family and friends can find peace through this awful tragedy. What kind of pain forces anyone to put a gun to his head no less in his mouth to end the torment, the agonizing mental and psychological pain of living one more second. If only for that second I could be there to tell you that it will be all right and this scourge, this pain will pass. I believe FCSO is NOT properly trained to deal with the mentally unstable. Sure, shine a light in his face!! I bet THAT helped a LOT! So tell me how the deputies are suppse to see this guy with a gun when its dark out if they don’t use a light? Every been pulled over or seen someone pulled over at night? The spotlight is always shined on them. Many of cops have been killed by suicidal people. Police safety is a priority, unlike the young man, these officers want to live…. If you know someone is armed and capable of shooting you would you not want to be able to see that person? The deputies want to go home at the end of their shift. They do not know if the subject wants to hurt others or not. Are deputies suppose to believe a complete stranger holding a gun that he does not want to hurt others? What if it was a ruse to get deputies there and then open fire on them? People in that desperate state of mind are unpredictable. Not to mention seeing as he was intent on doing it a spotlight would not influence whether he pulled the trigger or not. It is a tragic situation and my prayers are with him and his family but lets not go pointing fingers at those who tried to help this young man during his final moments. There are services available for people that are suffering almost any kind of stressful situation you can think of (how are Flagler County’s services?). But people have to want help. There is no way to force anyone to accept help. Sadly, I think this is but one example of that, and won’t be the last. Very, very sad. I wish I could have known this young man and somehow have steered him away from his solution long before he reached such a level of hopelessness. Perhaps there could be more education of our young people about how to handle life’s tragedies, short of desperate measures. We all need to treat one another better, and be ready to reach out. Unfortunately we didn’t know he had reached this point. He was such a good person and this is a terrible loss. Our family is destroyed. Please remember him in your prayers and thoughts. Yes Deborah, I certainly will, and again, I am deeply sorry for your loss. I hope it is helpful. I think most of these accept Medicade. It IS difficult to obtain help without money or insurance. Often times, it takes a person getting to the point of a “Baker Act” (like this young man in the story would have qualified for!) to get the individual into a treatment center, and that is only a 72-hour guarantee. Many times, the person will feel better after a few days and will want to leave and after 72 hours, they may not have reason to hold them any longer under a Baker Act….Until the next time they are in a critical state of affairs, and need a BA again. The only suggestion I can make, is to call the ACT treatment center in Daytona Beach, and see what they can recommend. =( Best of luck. And remember, you CAN’T help them, until they WANT help. Many a loved one has found that out the hard way…. Josh was an amazing friend, he was loved by everyone and could always put a smile on everyone’s face. I miss him like crazy, but I know he’s in a better place now. He is missed and will always be we love him very much. its so sad to hear hes gone. I have some good memories with him, and he will always be remembered in a good way. Joshua is my nephew – very beloved nephew. While I understand that this might be news – there should be respect for his family. We are devasted and are trying to grieve. We will never come to terms with this. All we ask is for some respect and privacy and of course thoughts and prayers for Joshua. He was an amazing person with a kind heart and soul. He was loved termendously by his family and our hearts will never be whole again. I personally know this family and Josh had more support than a person could ask for. His mother and his family did everything they could to get him the help he needed. He ended his life because he couldn’t see beyond his pain on that morning. Despite what this article depicts, Joshua did leave this world being right with all his relationships. Thanks, Jen! XO – We so appreciate your love and support during this time. You have been such an amazing friend for my sister and we are so honored to have you around. Josh is one of my good friends we have known each other since we were 7 years old, i love him dearly and will miss his laugh. Josh was an amazing person always cared for people and loved having fun. He was the best guy i had ever known, we made cookies together and got in trouble for the unnecessary mess we made. Talked about everything! Loved going on little car trips, laughing at the dumb stuff i would say (which was all the time). the advice we gave each other. i will miss him so much. love you Josh keep riding! So does anyone know of a funeral or some type of memorial ceremony.? Josh was a very good friend of mine. I was and still am shocked about what happened to him. He was a good kid and a good friend. Many people back in Connecticut have been posting things for you Josh. You will never be forgotten. My sympathy goes out to Josh’s mother. R.I.P Buddy I hope you’re in a better place now. I just met this young man this summer at the beach with my Daughter and her boy friend he seemed like a nice guy always friendly and happy from what I saw. I have worked in the mental health for 12 years and there is not always a sign that something like this is going to happen. I do know a couple of things Drinking and a gun never has a good out come then you add some depression and this is what happens.Young people need to know the dangers of depression and drinking it may just be me but why does a 22 year old need a hand gun for ????? When I was growing up I remember josh as if he were an older brother to me he taught me how to get better at b.m.x and anything else I would struggle in. im so sad I didnt get to see him when he was last up in CT but I do miss you josh and I hope that your in a better place josh, I love you and miss you man. I will never forget the first day I met Josh and it turning into a long conversation about nothing. We hung out just about every single day after that. He was a sweet guy and a really fun and crazy friend, never a dull moment. I am so glad I had the opportunity to become such great friends with him and I’m sorry we lost touch when he moved, but I always cared for him and always will. I could not have asked for a better time spent with him and I hate that things had to end in this way. My heart is saddened and I continuously think of him everyday, but I know he is resting at peace and in a better place. My love goes out to him, his family and other friends. To Josh’s friends and family–I don’t know if this will mean anything to you at this point but I had a family member commit suicide too. I understand the pain you are in and how overwhelming it can feel. Please do not hestiate to seek out help from a suicide bereavement support group if you need to, whether it’s an in-person group or just a telephone hotline. I know you will pull together to help each other and I hope you realize that there are many of us out there who do understand. My sincere condolences and best wishes go out to all of you. As a former neighbor, I just wanted to say that Josh was always there if I needed something. Whether it was working on my car, or simply needing to borrow a tool, Josh couldn’t have been happier to help. He always treated my wife and kids with respect, and was a stand up young man. Prayers go out to your mom. Rest in peace Josh. Anonymous, why not prayers for his father, who lost his partner a week later. This is a tragedy for all his family and friends. I do know of him being somewhat like this before to the point he wasnt allowed to have a gun. Im sure he had to have shown some sign of depression even if it was the slightest, I wish we couldve stopped this tragedy. I miss him dearly. Hun I hope you rest at peace now since you couldnt find your peace here. Josh and his family are in my prayers. I just wish I could give him one last hug. <3 Until we meet again. And what about the deputies who had to witness this terrible event? At not point was there a critical incident debrief for them…..AT ALL!!! They are the ones who have to live with this as well. Ordinarily, under THESE type of circumstances, there IS a debriefing for those that were directly involved. I don’t recall reading in this article anything about the lack of one, so is it fair to say that you are closely connected with the police force that was dispatched to the scene? I don’t see how you can know this otherwise. However, there are Employee Assistance Programs for state employees that are confidential. Should any of the personnel that were dispatched have any residual issues, they can address them there free of public scrutiny. Possibly some of the synthetic marijuana involved along with the alcohol. Some people have bad reactions as they are constantly reformulating to stay ahead of the law. A doctor’s son shot himself due to using this, after hospital thought he was okay to return home. It’s a shame/some people he hung out with were involved with the synthetics, having to go to hospital sick from it. Very, very sad. God bless his loved ones !